This professional 4-channel mixer represents the next level in creativity, delivering flexible connectivity, mind-blowing effects and performance features—all with the quality you’ve come to expect from Pioneer. Built for demanding professional use, the DJM-900NXS2 features a high-quality, 64-bit audio mixing processor, a 96kHz/24-bit sound card and Pioneer’s signature Magvel crossfader. 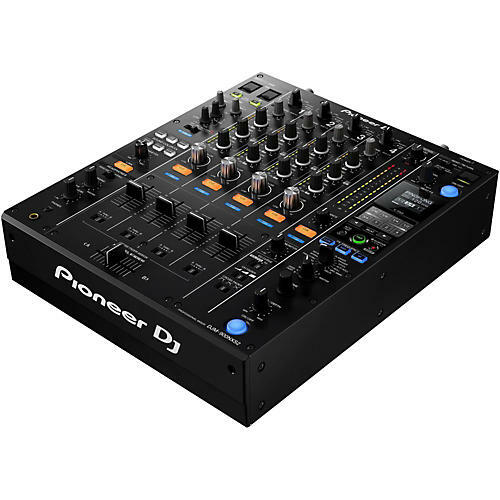 One of the features that sets the DJM-900XS2 apart from the rest is the fact that it boasts dual USB inputs and two onboard soundcards, allowing two DJs to connect their respective laptops to the mixer simultaneously. For modern digital DJs, this is a must-have feature, and is essential for smooth, seamless transitions between sets. The DJM-900XS2 also takes a step ahead with EQ-specific beat effects. Three buttons in the effects section give you the freedom to select what frequency range (low, mid, hi) to which you'd like to apply any of the mixer's effects. You can select one button, or all of them—it's your call. Combined with new onboard effects including ping pong, vinyl brake and helix, the possibilities for customizing your mix are bounded only by your creativity. For DJs who enjoy the tactile mixing experience of digital vinyl systems (DVS), the pro-grade DJM-900NXS2 fully supports Serato DJ, Tracktor Scratch Pro 2 and rekordbox dj DVS setups. But Pioneer took things a step further by outfitting the DJM-900NXS2 with four phono inputs instead of the usual two or three, giving vinyl-loving DJs the freedom to set up their booth however they want. Experienced DJs will appreciate the DJM-900NXS2’s familiar layout, which has become the standard in nightclubs worldwide. Everything is right where you'd expect it to be, from the smooth volume sliders, master level knob, to the 3-band EQ on each channel—you'll feel right at home the moment you get behind the decks. Don't let the DJM-900XS2's modern bells and whistles fool you. This 4-channel DJ mixer is built to withstand the rigors of professional use, thanks in large part to its all-metal chassis and robust build quality. This mixer is meant to be used, not simply admired. Whether on the main stage at a festival or in a small underground club, the DJM-900XS2 has all the features and connectivity a professional DJ could possibly need.